Will: Tell me a little bit about the history of Best Coast. How did it all come together? Beth: I moved home to los angeles after living in new york for about a year. I pretty much just started writing songs as soon as I got home. I asked my friend bobb if he would help me record the stuff, and if he wanted to play with me, and he said yes, and almost a year later, here we are ! Will: You are known for your California sound. Tell me about some of your influences, and how you pieced together your sound! Will: I read that your dissatisfaction in NYC helped you get to where you are right now? I am a native New Yorker so I am a bit offended (jokingly)! Care to explain? Beth: :-p new york just wasn’t the right place for me. I think some people are cut out for it, and others aren’t. I am way too lazy and chilled out to live in new york. Too much effort, hahaha. Plus, I couldn’t stand the weather. The cold made me so depressed. I think I’m just better suited to live in a place where the sun shines 80% of the year. Will : You released a lot of singles! Can you tell us a little bit about them? Beth: The first one we did was on art fag. My friend Mario runs the label and he asked if I’d be down to do a 7”, so I just gave him 3 songs that bobb and I had recorded. That is the one that has “sun was high (so was i)” on it—that’s actually the first time I ever wrote/recorded as best coast. the second one we did was on a label based out of NY called group tightener. Again, just gave them some songs we’d already recorded. The most recent one we did was the black iris 7”. For this one we actually went into a studio (black iris studios, in LA) and recorded an a and a b side—which turned out to be “when I’m with you” and “this is real”—we added live drums and experimented with production and stuff, and it was really fun. It’s pretty different than the other 7”s, which I think is fitting, because it’s a lot closer to the way the album will sound than the early stuff was. Will: Your sound is very lo-fi, what are your thoughts about lo-fi and its takeover of the indie scene? Beth: Personally I don’t really understand where the resurgence came from, but I’m glad its around. Will : Do you think you will ever abandon the lo-fi production/sound and move to a cleaner sound? 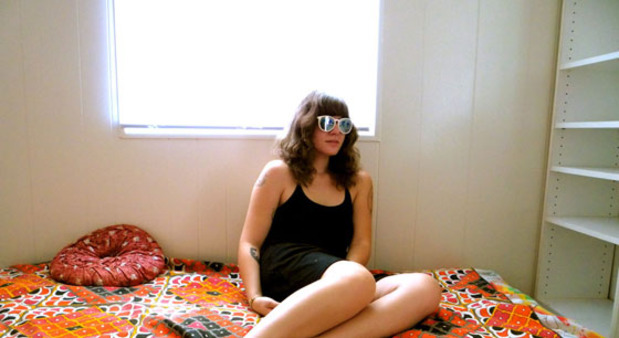 Will: What has it been like touring as Best Coast? Beth: well we haven’t officially toured yet, but we head out for our west coast tour with Vivian girls in 2 weeks, and I couldn’t be more excited. Will : Whats your Almost Famous moment? If you’ve never seen the movie (watch this: http://www.youtube.com/watch?v=7Qn3tel9FWU ), What is that one “defining” moment that you will always remember during your time as Best Coast? Beth: probably when I was asked to be in nylon magazine as part of a feature of up and coming female musicians. I was kind of like “wait what, really?? ?” it was pretty exciting, and my parents were really stoked too, which made me even happier. Will : What does the future hold for Best Coast? When is your debut album coming out! Will you re-use any songs from the 7 inch singles, or will it be all new stuff? Beth: The album will be out at some time this year, hopefully in the fall. It’s all new recordings! I’m both nervous and excited about it, but mostly I’m excited. Beth : Well I’m allergic to gluten so I don’t drink beer, but when I did drink beer I was really into Budweiser, plain and simple man. Will: Favorite Album Of 2009? Will: Favorite Album Of The Decade? Will: Job you would have if you weren’t in a band? Beth: chef or journalist or maybe a cat trainer. There you have it guys! Thanks a lot to Beth for taking the time out of her busy schedule and answer some of my questions! !